Disruption is the new normal in the global, mobile, digital world. New technologies can be deployed with a swipe of a finger, appearing across billions of devices all over the world, changing market dynamics in a heartbeat, while competition from emerging markets isn’t just producing cheaper goods and copycat products, but radically redefining the terms of production and distribution. Consumers want the latest and greatest, and they aren’t necessarily loyal to a brand or even a concept. At the same time, they are demanding more from brands—from quality to accountability, and they are very vocal and social about it. Economist Joseph Schumpeter famously defined the term as, “Innovation is creative destruction where entrepreneurs combine existing elements in new ways.” That has never been more clear than now, when tiny startups have started the restruction of entire industries. What isn’t always clear is that this didn’t happen by accident. Many people view innovation as spontaneous, unorganized and unpredictable. This couldn’t be further from the truth. While the results of innovation can seem unpredictable, the process shouldn’t be. Masterful innovators aren’t just throwing stuff at the wall to see what will stick (although there is a time and place for this kind of experimentation), they are structured, methodical and systematic in organizing their innovation projects. This structure is essential in times of explosive disruption, where both possibility and uncertainty are nearly infinite. Once an innovation project or a series of projects has begun, things move quickly, so it’s important to have the correct framework in place for making decisions. The 360 framework is a data-based methodology developed from a systematic examination of what makes innovations successful, as well as an audit of an organization’s unique capabilities. It is not a formula because each organization will have different competencies and obstacles. While innovation has some specific characteristics—for example leaderships styles and cultural features such as the ability to collaborate —it is driven first and foremost by an organization’s DNA. This is why organizations must know themselves—and their partners—quite well before they can launch an effective innovation project. And this means looking closely at cultural competence, first creating awareness and then developing a common language to guide the process. Culture is like a basic operating system that runs in the background and defines what is possible. When it works, we don’t usually think about it too much, but when it’s time to make strategic or tactical changes, we have to be very intentional. We will look closely at leadership and talent, which drive innovation results, but first we lay a framework to align with. 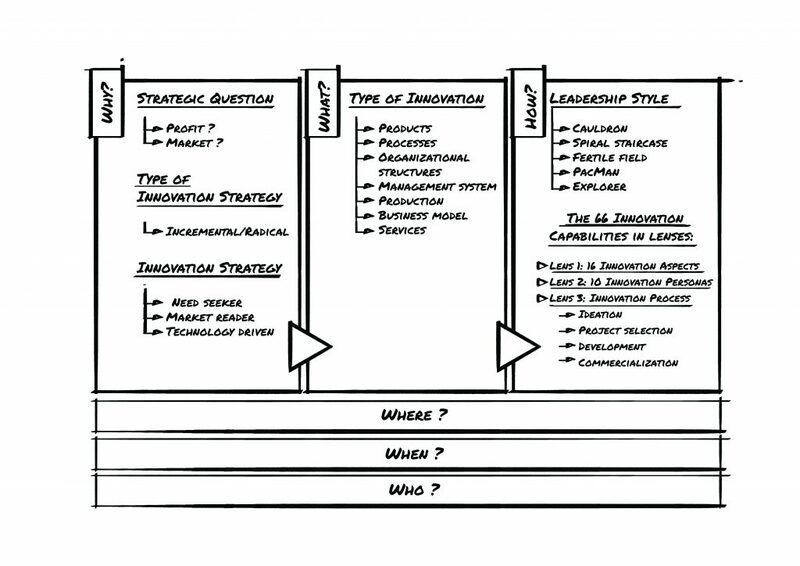 This foundational framework for accessing innovation and innovation management is divided into three areas, defining broadly the why, what and how of your innovation project. What is the end goal? Here is where you specify if your primary goal is to achieve better profitability or a broader market share. Each requires a very different set of actions and metrics. Many projects lose traction when the team doesn’t have a single vision of what success means for this innovation project. Within this section, your goal for the innovation will determine where it lies on the scale from incremental to radical innovation and the most intelligent strategy for gathering pre-project data. Here you begin to narrow down the type of innovation that matches your organization’s skills and capabilities. Your options for innovation type range from products to processes to business models to services. Many organizations will want to innovate in different areas, but each project requires its own analysis. This is a critical segment where you match up the project’s goal and type to the leadership style best suited to bringing in the project under budget and on time. We’ve identified five different leadership styles and correlated to them to specific innovation activities and horizons. At this point in the framework we look deeply at your organizations capabilities. Data from our InnoSurvey becomes highly valuable at this point as we generate a customized innovation profile for your team, specifying where you excel among 66 innovation capabilities in three management lenses. After the essential framework of the innovation project is in place, along with KPIs that measure progress toward strategic goals, the support details can be filled in rapidly. The ‘where’ questions include which markets will test the working prototype of the innovation. ‘When’ can’t always be answered with certainty, especially for long term projects, but goalposts and review timelines can be defined. Finally, you can answer the ‘who’ questions related to the innovation team members, the internal stakeholders and the external partners who will assume responsibility for the success of the project. The key to this entire innovation management process is preparation. Then you can expect the unexpected, knowing your well-prepared innovation team can adapt in real time to take advantage of changing conditions, without losing their balance. This preparation will allow the team to learn quickly and gain insights, applying them to the next iteration and developing a unique strategy. This is the secret of innovations that take the lead. You will never be able to follow your way to the front. Each innovation project is as individual as the team that executes it. What you will be able to do with the support of Innovation360 is find the most intelligent innovations that take advantage of your organization’s unique capability profile. Design with the goal in mind, dedicate resources that give you the best shot at success and then execute with precision. All it takes is a comprehensive innovation management framework that adapts to a rapidly evolving world.